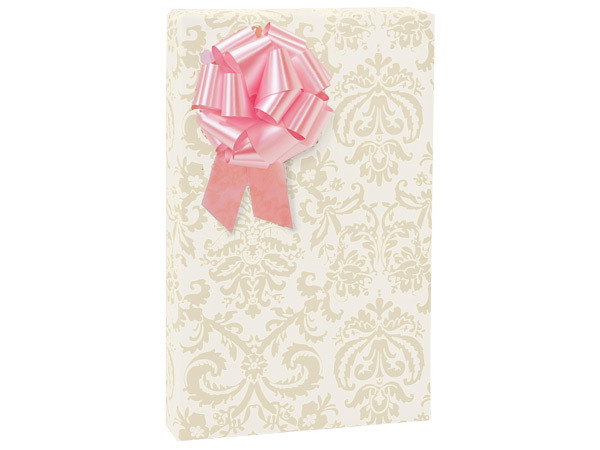 Pearl Flourish Gift Wrap features pearl brocade designs on white. Bulk wrapping paper roll measure 24"x85' and wraps on average 70 gifts. Design is part of the Green Way® brand. Gift wrap is printed on recycled paper or paper sourced from well managed forests. Made in the USA. To better show the design of this gift wrap, we have enhanced the contrast of the image slightly. Our Wedding Gift Wrapping paper includes designs for wedding, bridal showers and anniversary celebrations. They represent the best in design and color, all at competitive prices.These wraps are part of the Green Way® brand and are printed on paper sourced from well managed forests. Made in the USA. All designs are stocked in half ream rolls of 24" x 417' which can wrap approximately 175 -200 gifts. Smaller gift wrap rolls measuring 24"x85' are also available in cutter boxes. Each 85' roll of gift wrap is packaged in a box for storing. Scissors are needed for cutting the paper. These 24"x85' cutter boxes will wrap approximately 40-50 gifts.